This FREE Escape Room resource is perfect to leave with a sub or to use anytime you want your kids to experience some self-directed learning. It begins when YOU- the most awesome and creative teacher in the history of the world- take your class to tour the great pyramids of Egypt. The trip doesn’t go exactly as planned, and now the kids must work to solve a series of FUN challenges based on reading comprehension and steeped with a variety of skills that begin with FOLLOWING DIRECTIONS! 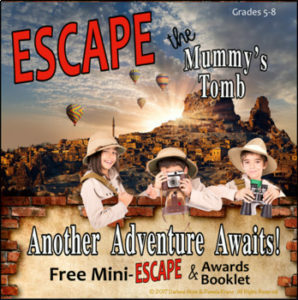 Students will use critical thinking skills, problem-solving, reading comprehension, writing, and order of operations to ESCAPE THE MUMMY’S TOMB! Everything is organized and ready to go! All that is needed is a printer. The set up is easy! ♦ Awards to celebrate a successful escape. ♦ FREE BONUS! An award booklet that can be used to document all past and future escapes is also included! Our ESCAPE activities are interactive and immersive. YOUR students are directly involved in the story. This is perfect to use for an observation, to set up for a substitute, to use as an end of the year activity, to use as a review, or to use on any day that you want to relax and watch your students have a blast AND learn together with a team! Completing the entire escape can take anywhere from 35-45 minutes, depending on how quickly the class is able to complete the activities. Students will not have to leave the room. This is NOT a scavenger hunt. Have fun and be sure to come back for more ESCAPE ROOM challenges! This awesome resource is a collaboration between Pamela Kranz and Darlene Anne.